Awesome tones and atmosphere for a great landscape. Very good light and so great emotion to see it. The only thing...I would have cut some sky or some sea to respect the "thirds rule" (hope it's right) to give more depht to the whole shot. So nice work, see ya. I love the troubled sky and the way you creat a rytm with the pier. thanks for your comment. You are correct about the wake. I deliberately included it because I thought it would add more subtlety to the composition (and also because I really had no other choice unless I almost complately excluded the sea in the frame!). Maybe its a sea monster about to surface! Hi Omar, love the tones in this one, but I can't quite make out what I see in the lower right corner. The wake of the ferry? Must be, but it looks a bit superimposed, if you know what I mean.... Other than that, a fine shot. Well captured! Wow , wonderful image of a moody landscape, i like the lighting in the sky, and the reflection on the sea. Actually I am still about 1 hour drive from the sea. England does not have many forests left either. I grew up in Canada, which I miss a lot because it had so much natural beauty. I would like to live closer to the sea or to real nature again. And thanks for your comment, always nice to receive them from you. very nice moody sunset composing. strong colors and lighting. the bridge fits well with the scene. great light and colors too ! The composition and the color tones of the sunset gives the image a warm mood. I like the lighting of the sky too, well done my friend. Hi Omar..beautiful scene ! lovely ! thanks for your comment ! 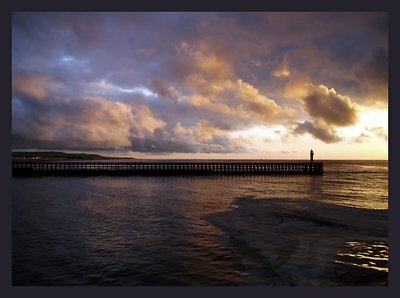 The figure on the end of the pier is the crowning touch on this image. It has a somewhat desolate feel to it because it makes me wonder what the person is doing. Is he waiting, meditating, watching, longing? This photo definitely makes one think. Bottom line- I love it. Great work Omar! Beautiful photo Omar, I love the clouds, the detail and the colors. excellent shoot, excellent colors and excellent picture... congrats!